Pick your favorite way to remember your visits to Door County, Wisconsin: snowflakes in the winter woods, spring cherry blossoms, summer sailing, or autumn leaves. Think warm thoughts while knitting a pair of these socks in Blackberry Ridge's soft, 3-ply 100% wool, spun and hand painted especially for these socks. 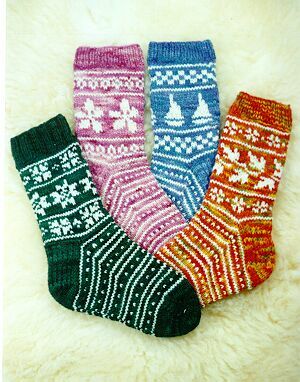 These are perfect for giving either as a kit to your favorite knitter or as knitted socks ready to keep 10 special toes warm. Each kit contains enough 100% wool yarn to knit 1 pair of socks.